I have a headlight that is cutting off and then back on. Is that a good sign of a bad headlight, or just as good a sign of a loose connection or bad generator? I'm looking but no luck yet. Another clue--it was off without the engine running. Seems to me I have a bad wire somewhere. Check the ground for that light. If all other lights are working, and your ammeter isn't showing a high current draw off the battery with the car running, it's highly unlikely that it's with the electrical system as a whole, more likely an issue with the ground or the lamp itself. Test for battery voltage at the light with the light switch on. Wiggle the wire during testing to make sure it isn't broken and making intermittent contact. If 12 volts, problem isn't the switch or any wire up to that point. Then check ground, specifically where it attaches to the body. Probably will find a bit of corrosion there. Quickly remedied with a file or some sand paper. A bit of dielectric grease around the ground point (if that turns out to be the issue) will help keep the corrosion from returning. Does it affect both high and low beams (main & dip)? I would expect a ground to affect both. I have never had an intermittent failure of a head lamp, just the usual 'sudden unexpected darkness' as invented by Joe Lucas. I had new working headlights go out one day. It turned out to be the lucar connectors. Once I cleaned them and used some dielectric grease the problem was solved. You have a bad connection somewhere. It's really that simple. Having just installed said ground connectors I can certainly agree with you. A very poor connector but they do seem to hold up for a while. Did the dielectric grease thing. Yeah, for a 3 cent part intended to have perhaps 10 year lifetime, there are still a lot of them doing their job 60+ years later. In my 40+ years experience with TR3s, I'd have to say the 'Lucar' connectors on the later cars are far more troublesome than the 'bullets'. Among other things, it's a lot more hassle to replace the springy portion than it is with the bullets. If you really can't stand those ground clips (or don't have a replacement handy), you can make a substitute with a short length of black wire and a 4-way sleeve. There are plenty doing their jobs 60 years later. Problem is, there are plenty NOT doing their jobs, even a couple years after installation, and it only takes one to create a problem. As for grounds, I don't know why someone thought it necessary to have a quick-disconnect ground--we all have screwdrivers, and an eyelet and screw would be much more reliable. When I get to the point of doing the electrics in my TR4A, I plan to use modern connectors, probably Molex. Not original looking, but sometimes reliability is more important, and most connectors will be out of sight, anyway. As for the grounds, I'll do what I did in my MG, return them all to a common ground point. There's a lot you can do to improve the electrics in these cars without compromising them. 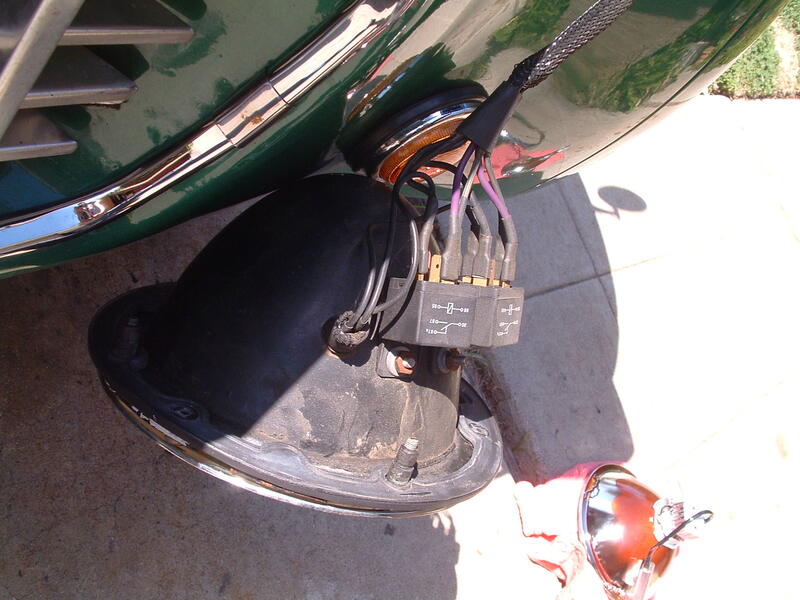 I've been wondering if it's worth it to invest in an updated wiring harness when I do my restoration. I've never had too much trouble with the Lucas gremlins, but I've always maintained my cars really well. I saw a harness from Revington and a few others that update the car to use modern relays for the lights instead of running all the current through the switches. Also makes it easy to wire in a switched aux. fan or fog lights, etc. Expensive, but maybe worth it? Depends on how neat you want it to look. All those things are fairly easy with the original harness (eg I have relays and seperate circuit breakers for each headlight all added to original harness) but the mix of old and new might not look right to some. I also like to allow a certain amount of evolution as I try out ideas I find interesting. For example, I want to build a variable speed fan controller, that will also allow the fan to run for a variable time after shutting down.